The lucrative global blood pressure monitoring devices and accessories market is dominated by companies such as Schiller AG, American Diagnostics Corp., Welch Allyn Inc., Omron Healthcare Inc., A&D Medical, Koninklijke Philips NV, Withings SA, SPENGLER, Bosch + Sohn GmbH u. Co. KG, SunTech Medical Inc., Spacelabs Healthcare, and GE Healthcare. Leading producers of blood pressure monitoring devices are likely to benefit from the steady rise in the prevalence of hypertension conditions, which is likely to ensure stable growth of the blood pressure monitoring devices and accessories market in the coming years. 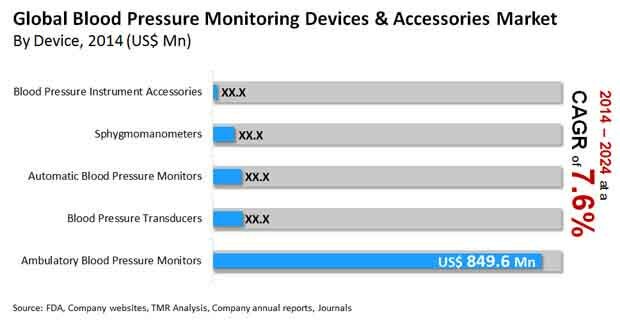 According to Transparency Market Research (TMR), the global blood pressure monitoring devices market is likely to exhibit a robust 7.6% CAGR between 2016 and 2024. The market’s value is expected to nearly double over this forecast period, with the market’s 2015 valuation of US$1.1 bn expected to rise to US$2.2 bn by 2024. By end use, the global blood pressure monitoring market is segmented into hospitals, clinics, homecare settings, and ambulatory surgical centers. Of these, hospitals are likely to remain the leading consumer in the global blood pressure monitoring market due to them being the primary point of care for long-term blood pressure conditions. The rising demand for home-based monitoring in conditions that don’t require immediate attention is likely to drive the demand for blood pressure monitoring devices in homecare settings in the coming years. Incorporation of digital recording and communication channels in modern devices is thus likely to help the global blood pressure monitoring devices market in the coming years. Geographically, Europe is expected to remain the leading contributor to the revenue of the global blood pressure monitoring devices market. Governments in the region have consistently remained supportive of technological advancement in the healthcare sector, which has led to a promising environment in the Europe blood pressure monitoring devices and accessories market. Europe is also a key region for the development of home care solutions, which is also likely to drive demand from the Europe blood pressure monitoring market in the coming years. By volume, North America is likely to remain a major contributor to the global blood pressure monitoring devices and accessories market thanks to the widespread availability of hospitals. Several factors have contributed to the steady growth of the global blood pressure monitoring market in recent years. The most important of these has been the rising prevalence of hypertension, among other cardiovascular disorders, in developed economies. The sedentary lifestyle becoming widely popular among urban citizens in developed regions such as North America and Europe has resulted in increasing prevalence of cardiovascular conditions due to the common association of a sedentary lifestyle with unhealthy diets and a lack of regular exercise. This is likely to remain the prime driver for the blood pressure monitoring devices and accessories market in Western economies. Due to the vital importance of the healthcare sector in the economic advancement of a region, government support to technological advancements in medical devices has been forthcoming. Rising economies in Asia Pacific, the Middle East, and Latin America have been at the forefront of this movement in the last few years due to the rising purchasing power of consumers in the region. Sustained government support is thus likely to be a major driver for the global blood pressure monitoring market in developed as well as developing economies in the coming years.